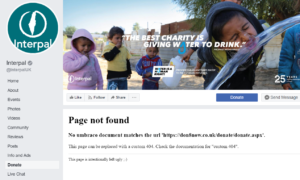 Facebook has blocked Interpal’s donations buttons from its platform. This follows a letter to Facebook from UK Lawyers for Israel (UKLFI) last month, pointing out that Facebook was in breach of US terrorism sanctions by allowing Interpal to raise money through its site. Interpal is designated as a foreign terrorist organization by the US and is also listed as a Terrorism Financing Entity in Canada and included on Australia’s consolidated list for its affiliation to terrorism. Interpal, whose full name is The Palestinians Relief And Development Fund , has a Facebook page here. However, none of the Donate buttons on the site are currently functioning. UKLFI pointed out to Facebook that all US entities and their subsidiaries must comply with the US sanctions. Facebook had been assisting Interpal to raise money, because Donate buttons on Interpal’s website directed users to a page showing information on how to donate to Interpal. The “donate” button at the top of the home page, that directed users to Interpal’s website no longer works. The “donate” button on the left hand side of the home page also no longer works. The Office of Foreign Assets Control (“OFAC”) of the US Department of the Treasury, designated Interpal as a Specially Designated Global Terrorist (SDGT). Federal Regulation §594 on Global Terrorism Sanctions Regulations applies to Interpal meaning that no US person may provide services or provide technological support for the benefit of Interpal. Interpal has suffered a long list of problems as its various donations methods have been shut down over the past year. It has lost credit card donations, BT MyDonate, Just Giving, and Give as You Live.